A few years ago, a professor friend mentioned reading about Mark Twain's fabulous gala 70th birthday party at Delmonico's, which was attended by the leading literary lights of the day. The article was in Harper's Weekly for December 23, 1905, and I was all agog because I knew that my novelist grandmother Onoto Watanna was present, along with her friend Jean Webster, a great-niece of Twain (and author of Daddy-Long-Legs). 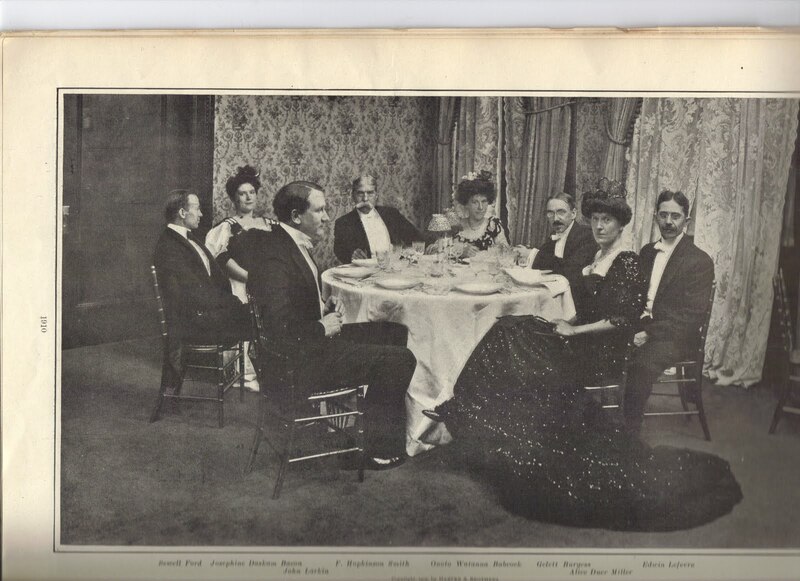 Photographs were taken of each table, and I was delighted to obtain scans of the pictures through the good offices of my friend Peter Hanff and Bob Hirst of the Bancroft Library at Berkeley. I immediately began Googling the guests, and made some surprising discoveries. Later, I was fortunate to score a copy of Harpers myself, on eBay. Now it has belatedly occurred to me that my blog is an ideal format to show some of these pictures, tell about these literary celebrities, and in general try to recreate a magical evening at Delmonico's, over a century ago. There is not space for all the pictures (there are 20 group portraits, as well as an artist's rendering of the entire scene), but I can impart some of the cream. The guest list is fascinating...170 celebrities and authors at all stages of fame, including Willa Cather, Frances Hodgson Burnett, John Luther Long, Charles Chesnutt, William Dean Howells, Dorothy Canfield, Bliss Carman, Andrew Carnegie, Emily Post, May Sinclair, Mrs. Woodrow Wilson, Princess Trebetzkov. 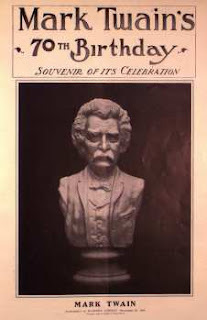 Each guest received a plaster of Paris bust of Twain. My grandmother's has come down in our family. Of course I was most eager to see the picture of my grandmother. I longed to know if she wore Edwardian dress like the other ladies, or a kimono? 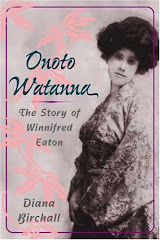 For Onoto Watanna is considered the first Asian American novelist, but she was born Winnifred Eaton (1875 - 1954) and was raised in an entirely English-speaking home in Montreal. Her father was an English painter, Edward Eaton, her mother Grace Trefusius was Chinese but had been educated in England, as a missionary. They had 14 "half-caste" children, and the oldest daughter, Edith (1865 - 1914), was also a writer. Together they are known as the "Eaton sisters," but Edith, who used the pen name Sui Sin Far and wrote stories of the immigrant Chinese, is held in high critical and social esteem, as the godmother of Asian American fiction. 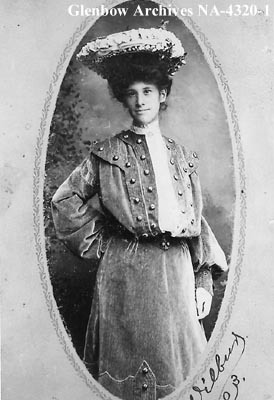 Winnifred, or Winnie, sought a frankly commercial career, and took on a fake "Japanese" identity, the better to publicize her fashionable pseudo-Japanese romances. She was a mistress of publicity, a poseur who changed her ethnic identity as it suited her. 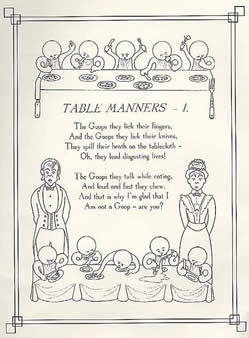 "The dinner began at 8 o'clock. Soon before that hour the guests began to gather in the parlor adjoining the Red Room. In the corridor outside, place had been prepared for an orchestra of forty directed by Nahan Franko. When the march, serving as a signal for the procession to the dining room, was played, Mr. Clemens led the way, with Mrs. Mary E. Wilkins Freeman on his arm. The couples that followed would have attracted attention wherever they were seen and recognized. 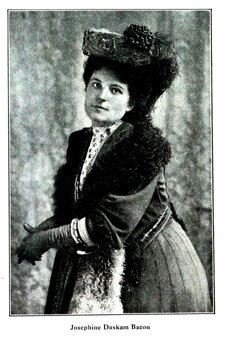 Col. Harvey led Princess Troubetzkoy, who once was Amelia Rives and still writes under that name. 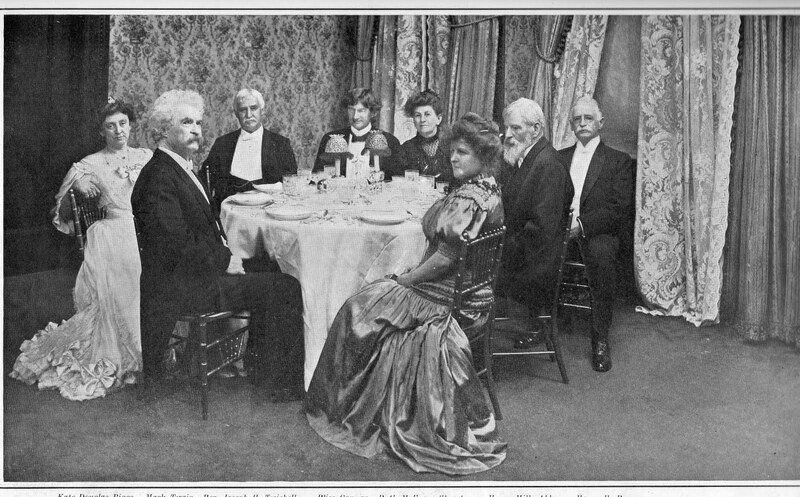 Andrew Carnegie and Agnes Repplier, the essayist, followed side by side. After them came John Burroughs and Mrs. Louise Chandler Moulton, who was the first author from whom Henry Mills Alden received a contribution after becoming editor of Harper's Monthly, more than forty years ago. The Rev. Dr. Henry Van Dyke escorted Mrs. Frances Hodgson Burnett, while Bliss Carman, the poet, led Mrs. Ruth McEnery Stuart. While the dinner was in progress the guests - one table at a time - went out into another room and had their pictures taken in groups. The pictures will form the most conspicuous feature of an album which is to be given to Mr. Clemens as a souvenir of the occasion." 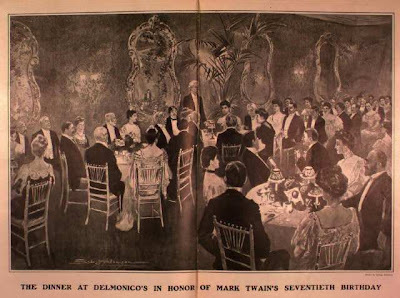 Delmonico's was then in its heyday, the luxurious eatery where Diamond Jim Brady and Lillian Russell held court, where Lobster Newberg and Oysters Rockefeller were invented, where the rich and famous generally enjoyed the high life. This was definitely an occasion I'd like to travel back in time to attend! 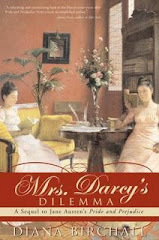 "...his friends and fellow-craftsmen in literature gathered in the Red Room at Delmonico's for the celebration. Barring a half dozen or so, all were guaranteed to be genuine creators of imaginative writings--or illustrators of such writings. 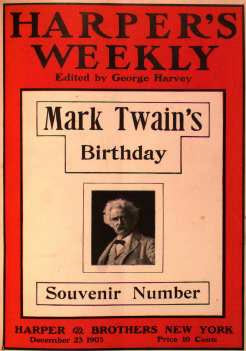 The guarantee was furnished by Col. George Harvey, editor of The North American Review, who was the host of the evening as well as the Chairman." Funny, isn't it, how all the notable literati of an era are but passing shadows - who knows all these names now? Only scholars. Some were nearing the end of their fame, others were still so early in their careers that you wonder how they got invited. 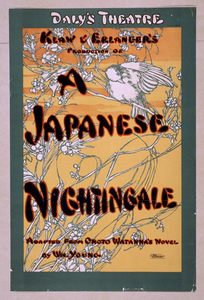 Winnie was at the apogee of hers, for her best selling novel A Japanese Nightingale had sold 200,000 copies in 1901 (a copy is in Mark Twain's library; the house site indicates that it is one of the last books that his wife Livy read), and the previous year (1904) was made into a Broadway play, which flopped: a review said it the play died "like a poor little bird that had twisted its larynx." At this stage of her life Winnie was doing what she called turning out "a book and a baby a year." 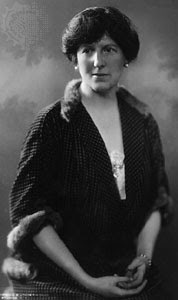 There she sits, demure, age 30, looking very pretty and concealing her pregnancy in her elegant Edwardian dress, her dark hair piled and rolled high, at a table of people who all look rather ineffably stiff and bored and as if they don't have a lot in common. Yet I like to think Winnie was well entertained by Burgess; at any rate, she looks as if she were. The other man at her table, Edwin Lefevre, is the author of Reminiscences of a Stock Operator - which is one of my husband Peter's favorite books. Imagine her sitting there with him and Goops! (I do hope they didn't lick their fingers). I know I commented on FB, but wanted to say here how fascinating this was. Wouldn't it have been grand to be there??? A delightful posting and interesting pictures. I have a book in my house by F. Hopkinson Smith. I found it in a used bookstore when there were still brick-and-mortar ones. I even tried to read it. What's especially appealing is the sense that we can touch these figures -- you are related to one and so you connect back and she sits among them. They don't seem so much history as part of the present or at least continuous with it. The little character sketches are fine too. 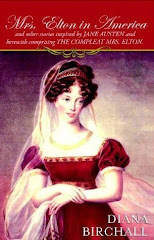 I so wish that Jane Austen had lived long enough to be photographed, like her friend Martha Lloyd. Another fabulous post. Just shared this on my Louisa May Alcott Facebook page and Twitter - too cool not to share! Love the dresses, and that fact that your family member was there! Thanks for linking this just now - definitely fascinating. I was just reading about some of these same people in A Passion for Book - especially Dorothy Canfield Fisher. I know her best as the author of Understood Betsy, but apparently she was also a founding judge for the Book of the Month panel and one of its mainstays. Frances Hodgson Burnett is another favorite of mine, of course for the usual suspects, A Little Princess and The Secret Garden and Little Lord Fauntleroy, but I think I like her The Lost Prince and T. Tembarom even better.